Steve Case, co-founder and former CEO of America Online, has watched the Internet evolve from its earliest days of noisy dial-up access to today’s integration with almost every aspect of commerce. Since retiring from the company in 2003, Case has engaged in a number of entrepreneurial endeavors, and also has served as a member of Barack Obama’s Council on Jobs and Competitiveness and as presidential Ambassador for Global Entrepreneurship. 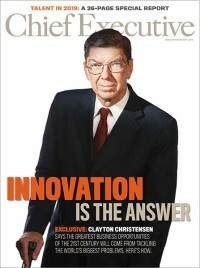 He is current Chairman of the Case Foundation which invests in individuals, nonprofits and social enterprises to connect people and foster civic action. Case says in his New York Times bestselling book, The Third Wave: An Entrepreneur’s Vision of the Future, that we are entering a “new dawn of technology” which will change virtually every aspect of business. Case recently spoke with Chief Executive about the coming tech 3.0 revolution and what CEOs should do to get ahead of the unparallelled digital changes in the coming years. Q: You say say we’re entering a “Third Wave” of a tech revolution which will be unlike anything we’ve ever seen before. Please explain. A: It’s really going to integrate the Internet in seamless, pervasive and even invisible ways throughout our lives. It will impact how we stay healthy, move around, how we learn and in the process disrupt some big sectors of the economy, including healthcare, education, energy, transportation, food and agriculture. People talk about the Internet of Things. This will be the Internet of Everything. Q: What does this mean for business? A: There are opportunities and challenges. Organizations will need to embrace the opportunities and lean into the future. If you’re a large [or mid-sized] company, you might partner with smaller companies that have ideas and agility to position you [for growth]. The second wave was really about software and apps. The third wave goes beyond that and will be about how to work with partners to integrate that technology into their workflow. The ones who see it as an opportunity seize it and figure out ways to embrace it will position themselves to do well. Q: Would you say that technology is also changing corporate leadership itself? A: Yes. There’s clearly a set of technologies that didn’t exist a half century ago. There are communication technologies, collaborative technologies, and new ways in which the marketplace, including your customers, can engage and react. If you don’t understand and take advantage of that, you can be caught flat-footed. The recent example with United Airlines [having to remove a passenger due to oversold seating] is something that couldn’t have happened a couple of decades ago. It requires a different approach of how you deal with your customers, employees and others. It requires you to be a little bit more open, more transparent, more flexible, and collaborative to succeed in a world that has new possibilities and is continuing to evolve at a rapid pace. Q: What should CEOs do to prepare themselves and their organizations for this Third Wave? A: They’ll need to understand what’s happening around the periphery of their sector and industry. Often these disruptions can come from surprising places. It’s not just about looking at your current competitors, it’s looking at what new competitors and technologies may be emerging. It also will require building a network around your company through partnerships, particularly with startups. Q: How will technology change how leaders think about talent? A: They’ll need to think about creating a culture and environment that allows people to innovate, take risks and be proud of what they’re doing as these things drive employee retention. You also need to realize that the average tenure is shorter and more people are working in the gig economy. As a result you always have to be on the hunt for talent [even when you’re not hiring] and doing everything you can to retain the best and brightest. Q: Would you say CEOs have a responsibility to help foster entrepreneurship in their communities and among their workers? A: Yes. I spent a good bit of time in the last few years traveling around the country on these “Rise of the Rest” bus tours. We visited 26 cities and traveled 6,000 miles. In many places, companies are stepping up and recognizing that the future of their cities is, in large part, a function of start-ups. They are the big job creators, and if you’re not backing new entrepreneurs, you’re not going to have a robust economy 20 years from now. My argument is that it’s in the interest of the communities they serve and in the self-interest of many of these companies and CEOs to work with entrepreneurs.